These brownies are for those days when you have a little extra time, or really want to impress someone that loves chocolate. Line a buttered 8 inch square baking pan wiht foil or parchment paper, letting enough hang over to make it easy to lift the brownies out later. Butter lining too! Heat butter, chocolate and cocoa in either a heatproof medium bowl over warm water, or in a microwave, stirring at 10 second intervals. If you choose the microwave be careful – they can be over heated in a few seconds. Whisk flour, baking powder and salt together in another bowl and set aside. Put sugar, eggs and vanilla in bowl of stand mixer fitted with whisk attachment and beat on medium speed until pale, golden and fluffy – about 4 minutes. Add chocolate mixture, and beat until combined. Add flour, beat again scraping down sides of bowl until well mixed. Pour batter into prepped pan, smooth top with spatula. Bake until a tester comes out with a few crumbs but not wet – around 35 minutes. Let cool for about 15 minutes in pan. Lift out brownies and allow to cool completely on wire rack before adding topping. Using medium saucepan combine water and sugar – bring to a boil over med-high heat, stirring until sugar has dissolved. When syrup starts to boil – QUIT stirring and wash down your sides with a wet pastry brush. Continue to cook, swirling pan every so often, until a medium amber – again – this is the place to watch carefully because it will go from a rich amber color to burnt pretty quickly. Remove from the heat, and quickly add cream, vanilla and salt. Stir very gently until mixture is smooth. Add pecans and stir until caramel begins to cool and thicken. A couple of minutes will do it. 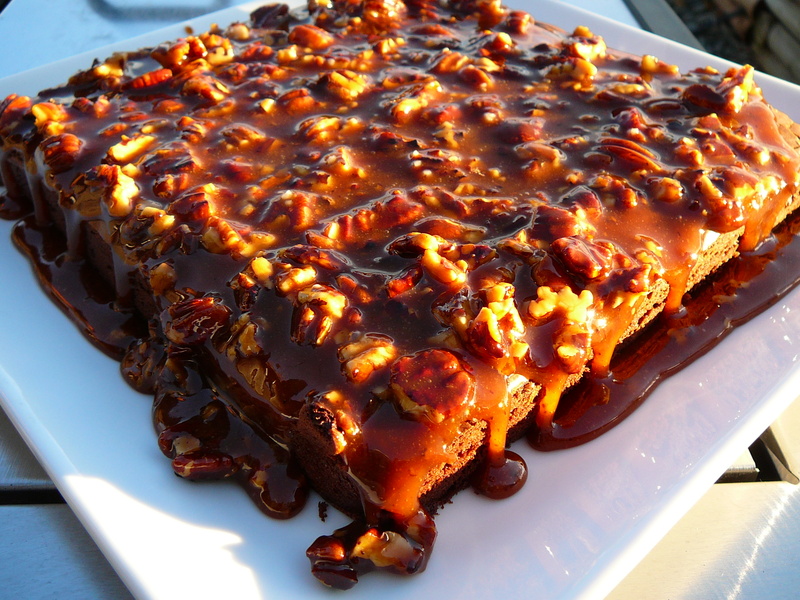 Pour caramel over cooled brownies and spread with an offset spatula. Refridgerate until cool – at least 30 min to an hour. Let brownies stand at room temperature at least 15 minutes before serving. If doing this for a dessert wipe knife with a hot damp cloth between each cut to get a smooth line. Serve with a dollop of whipped cream or vanilla ice cream. This entry was posted in Baking, Dessert, Recipes, Uncategorized and tagged brownies, chocolate, dessert, pecans by Chatty Kathy. Bookmark the permalink.